Images can serve as an entry point to other pages. To do this, you must set a link on the image click action. By choosing this option, everything is managed by BackBee. Click "OK". The click image opens in a popup on the page. This option is useful to see the details of an image more precisely. By choosing this option, you will have to choose the button title, its color and paste the URL of the page to which the user will be redirected. 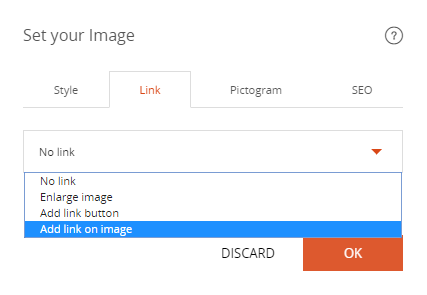 "Add a link to the image"
By choosing this option, the URL field appears. Paste the URL of the page to which the user will be redirected. You will allow the user to be redirected to the page of your choice by a simple click on the image.